Australian Textile Arts & Surface Design Association Inc.
ATASDA is and has been a strong and vital textile Association since inception (formally the Batik Association) and celebrates its 40th Ruby Anniversary this year in Sydney with Future . . . Past – a non-juried group exhibition open to all members nationally. Visitors to the exhibition will see a variety of materials and techniques. Future . 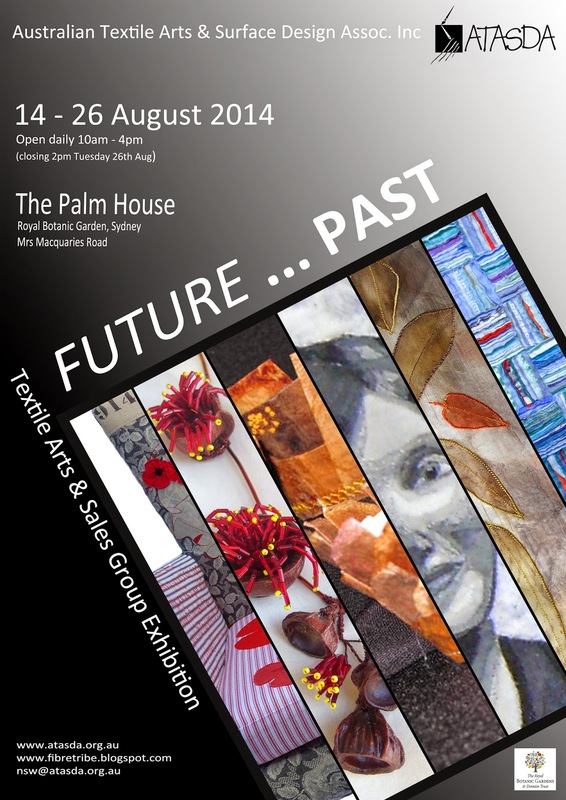 . . Past showcases diversity within the textile art world, including dyeing, felting, weaving, machine embroidery, surface embellishment, discharge, cloth construction, knitting, hand embroidery, printing and more. Members have created utilitarian, decorative, wearable, two-dimensional or three-dimensional works that are meaningful and definitely audience worthy. Future . . . Past is an opportunity for members to exhibit as a group – some may never have exhibited their work before – others are known nationally and internationally. Works are inspired by the member's past – music, a textile, a memory or perhaps an influence of a ‘time’ in their life. Works will be exhibited with an inspirational photo referring to the artist’s Past perhaps inferring the Future. Some exhibition works, objects and wearables will be for sale.